Venus-Jupiter and Mars-Saturn-Antares. 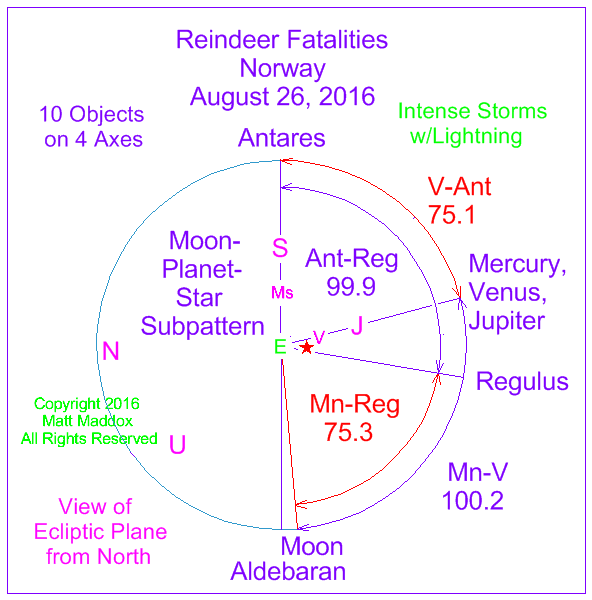 323 reindeer were killed by lightning from intense storms that rolled through Norway on that Friday afternoon. 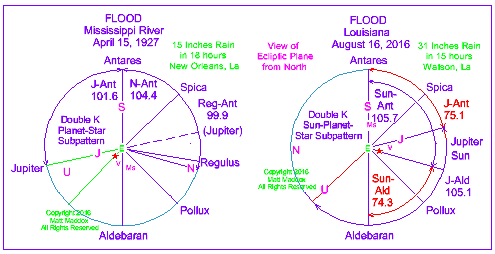 Please note the similiar symmetric astronomical patterns for both the 1927 and the 2016 Louisiana Floods. 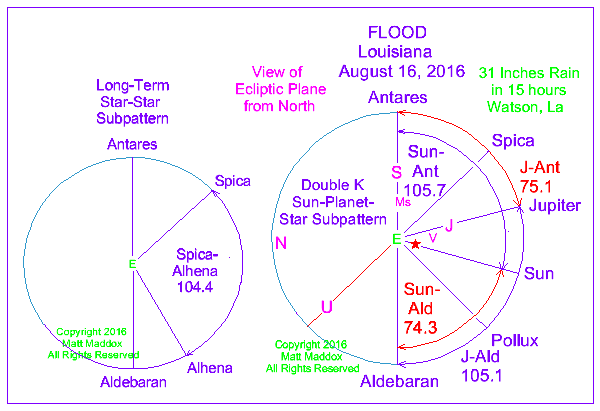 In both cases, the angular separations for the main subpatterns were close to the longstanding 104.4 degree angle of Spica & Alhena. this was a tremendous event which set up flooding and large-scale movement of sand. the significant subpattern shown is a tetrad or group of four axes. 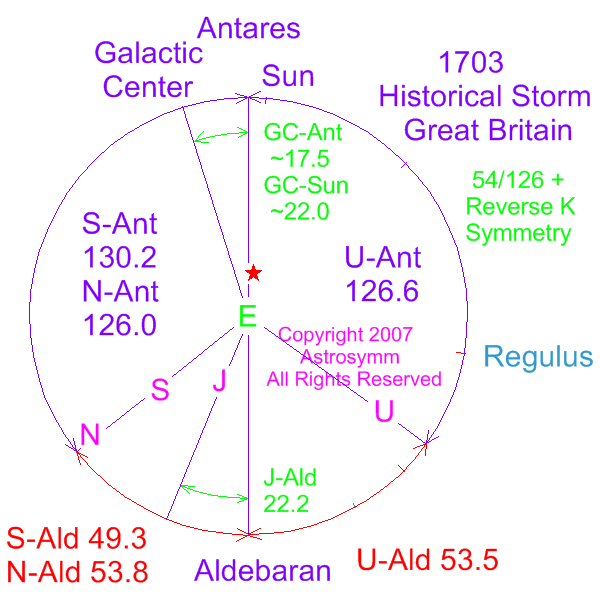 with earth at the center, the axes are aldebaran, mars-jupiter, saturn and spica. 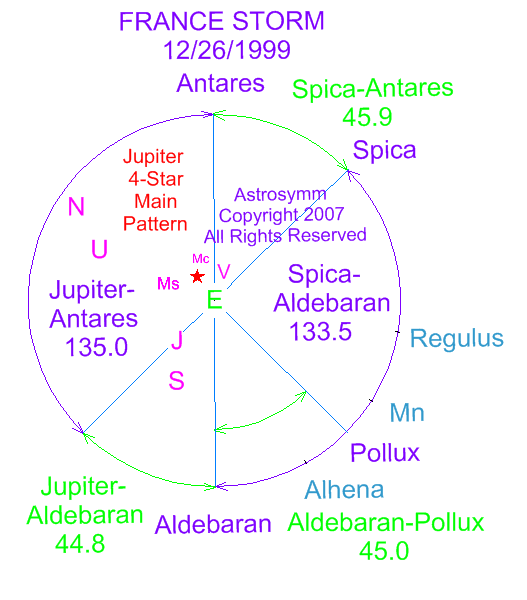 jupiter and saturn form a very close geometric or symmetric pattern with aldebaran and spica. 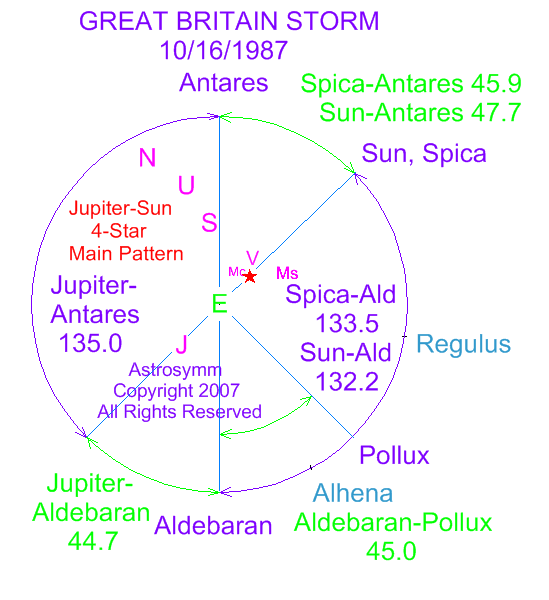 and an aldebaran-spica triad or tetrad is often associated with a storm or electromagnetic disturbance. the mars-jupiter alignment perfects the symmetry, creating 2 pairs of perfectly matching angles! with jupiter as a gravitational generator, mars acts as a diffractor and concentrates some wave energy from jupiter toward earth. 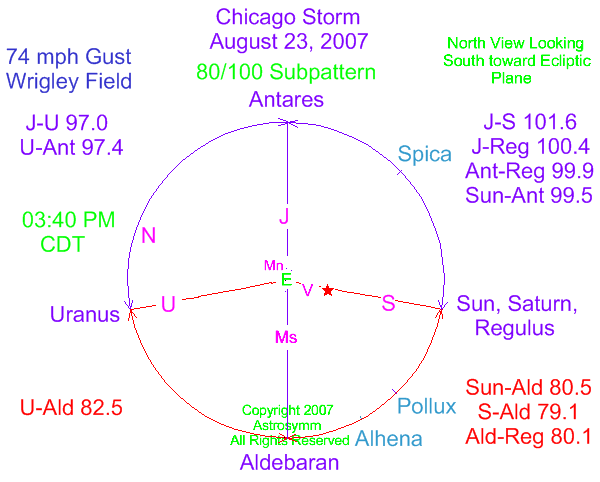 note that eight bodies are on four axes - the same basic symmetry that has persisted in fall of 2012 - associated with extreme events such as hurricane sandy on earth and plasma emission on the sun. in 1991 a storm with 100-foot waves hit the atlantic. 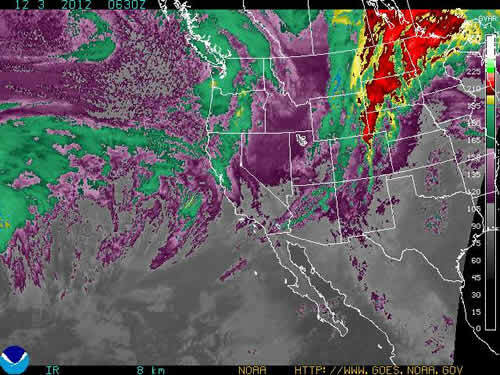 an east coast meteorologist called it “the perfect storm.” it was actually a combination of three different weather systems. note the amazing venus-jupiter-star symmetry! two very tight simultaneous alignments were active during this storm - <<sun-jupiter at 0.5 degrees>> and uranus-venus-earth-saturn with the venus-uranus angular separation at 1.9 degrees! 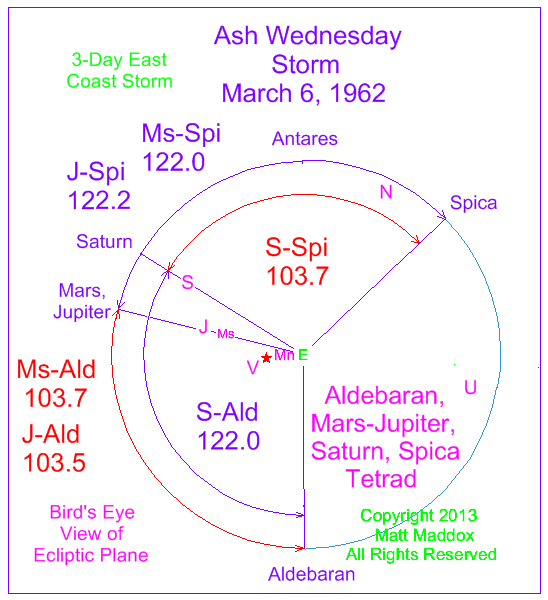 please see super tuesday tornadoes for a good example of a triad involving aldebaran and spica. see geomagnetic field disturbance model for a description of how the earth's magnetic field can be disturbed and cause powerful geophysical events. 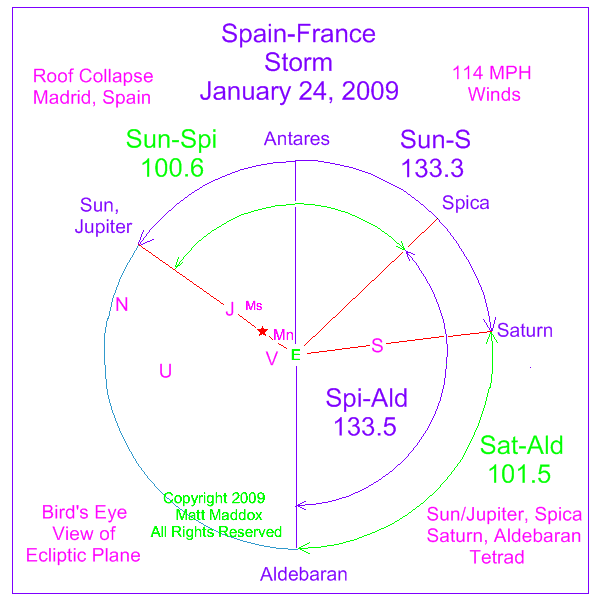 for a description of the power of this storm, please see the january 25, 2009 bbc article. 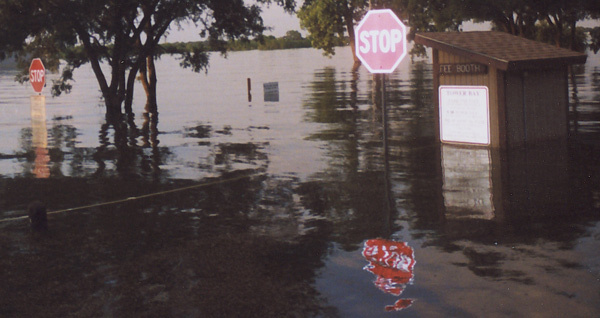 the us ice storm of the south plains and midwest starting january 26, 2009 would have the same approximate numbers for the beginning of the storm. an evansville, kentucky courierpress article describes the developing storm on january 27, 2009.
on the night of november 26-27, 1703, a tremendous storm hit the english channel. historical records abound which document the ferocity of this intense extratropical event. 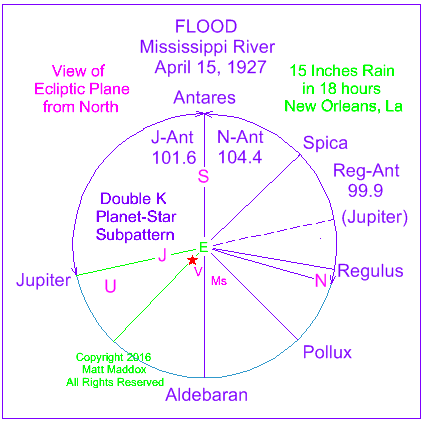 on january 31, 1953, another storm hit the area - resulting in historic floods in belgium and holland. these storms were 249 years apart - double the 124.5 year cycle described for volcanoes and climate. at exactly 249.178 years the following are the number of cycles for the large planets: jupiter - 21.006, saturn - 8.459, uranus - 2.966 and neptune - 1.512.
jupiter and uranus are at near-repeat points and show the same tilt orientation toward earth for both storms. saturn and neptune both "flip" in the sky with each planet individually showing approximately 180 degree change in orientation. so saturn and neptune each individually show reverse tilt orientation. planet-star symmetries accentuate the effect of the large-planet tilts and the result is a repeat event with large planets lined up on near-repeat axes! note the position of jupiter in this momentous uk storm. 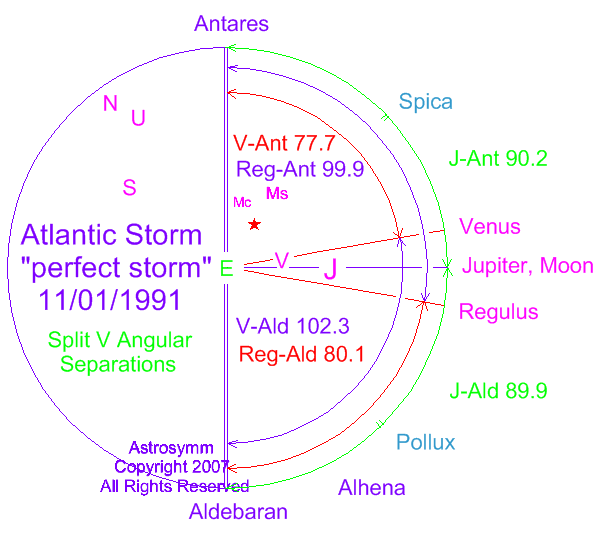 please note that jupiter has completed one full orbital cycle and is almost exactly at the same point in the sky as during the 1987 british storm! the earth sets up axes with three powerful units about 120 degrees apart in this 3-dimensional presentation: 1) achernar - an energetic star 2) deneb - another energy producer and 3) the combination of sun, saturn and regulus. regulus is another extremely powerful star relatively close to the earth. this symmetric combination is superimposed and simultaneous with the ecliptic (sun-earth plane) 80/100 degree pattern shown below. volcano tambora, shuttle columbia and nuclear accident tokaimura. 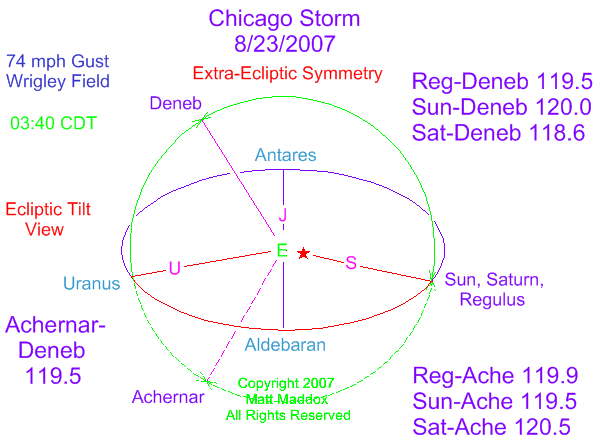 this amazing symmetric pattern is associated with the chicago storm of august 23, 2007. astronomically symmetric patterns can have a profound effect on the earth. the ideal of 80/100 degrees for the diagram is based on the angular separation of regulus with the backbone of antares-aldebaran. see the k pattern under ecliptic/volcanoes. on a long-term basis regulus is 80.1 degrees from aldebaran and 99.9 degrees from antares - powerhouses within the sun-earth plane. 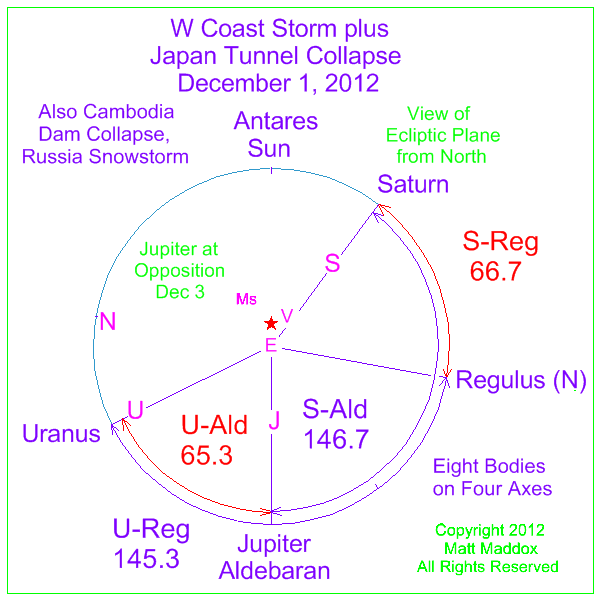 note the four major axes in this "peace-symbol-like" pattern: 1) uranus, 2) mars-aldebaran, 3) jupiter-antares and 4) sun-saturn-regulus! 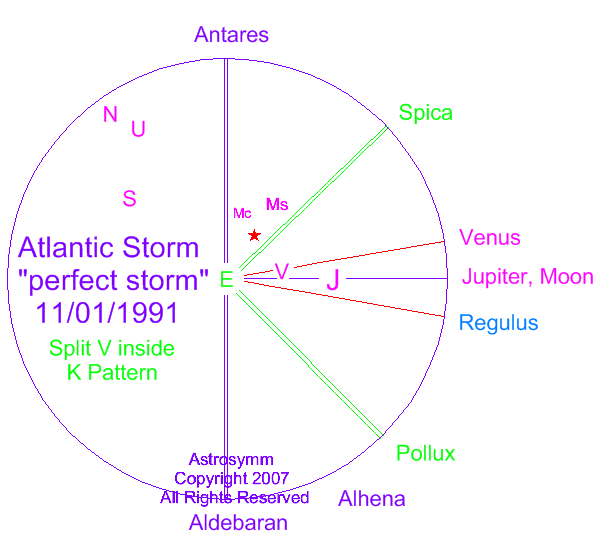 an extratropical storm was among the predictions for the august 23, 2007 predictive window!